Found in the nearby Large Magellanic Cloud, 30 Doradus is one of the largest massive star forming regions close to the Milky Way. Enormous stars in 30 Doradus, also known as the Tarantula Nebula, are producing intense radiation and searing winds of multimillion-degree gas that carve out gigantic bubbles in the surrounding cooler gas and dust. Other massive stars have raced through their evolution and exploded catastrophically as supernovae, expanding these bubbles into X-ray-brightened superbubbles. They leave behind pulsars as beacons of their former lives and expanding supernova remnants that trigger the collapse of giant clouds of dust and gas to form new generations of stars. At the center of 30 Doradus lies the star cluster R136 at the intersection of three of these superbubbles. However, with ages only between one and two million years old, the stars in R136 are too young to be source of the supernovae that brighten the superbubbles in X-rays. Instead, R136 is most likely just the latest cluster to form in 30 Doradus. It may be as massive as it is because these superbubbles have combined to concentrate their gas in this region and thus triggered intense star formation there. 30 Doradus is about 160,000 light years from Earth in the southern constellation of Dorado. It spans 800 light years across and is incredibly bright in many wavelengths. If it were at the distance of the Orion Nebula (1,300 light years), 30 Doradus would span the area of 60 full Moons and its optical light would be bright enough to cast shadows at night on the Earth. 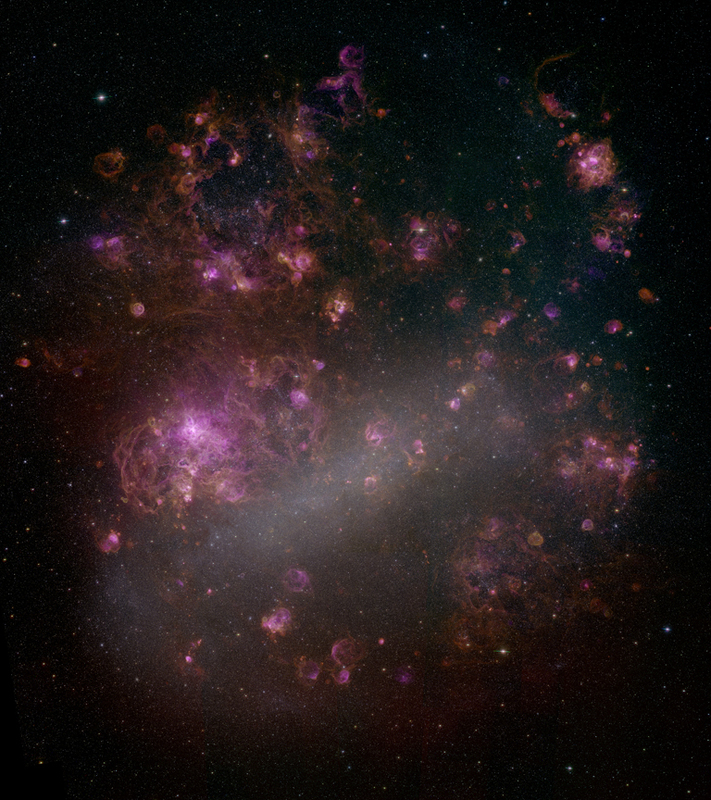 This latest X-ray image of 30 Doradus represents almost 114,000 seconds, or 31 hours, of Chandra observing time - three times longer than previously recorded. In this image, red represents the lower range of X-rays that Chandra detects, the medium range is green, while the highest-energy X-rays are blue. Credit NASA/CXC/Penn State/L.Townsley, et al. 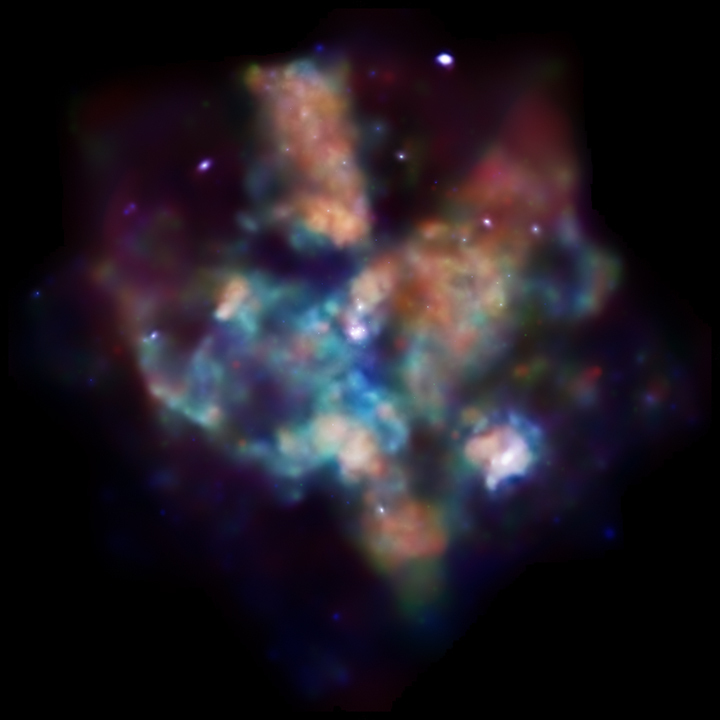 Scale Image is 24 arcmin across.